“you are what you eat” says it all! Some of you will be familiar with Jamie Oliver’s campaign for healthy school dinners in the UK. This young chef was appalled by the junk food served up in many schools. He started a campaign for healthy school dinners.You may believe that making up a packed lunch is a healthy option. However, it is estimated that 9 out of 10 lunchboxes for kids contain too much sugar, salt and saturated fats (Food Standards Agency). Not a healthy option. Providing lunchboxes like this each day does nothing to teach children good nutrition. A word on fats-children do need proportionally more fat in their diet than adults. The trick is to avoid fatty foods with little good nutritional content e.g. cakes and sweets. Instead use foods such as cheese, avocado, nuts (see note below). Some schools do not allow nut based products in the school. If your child can take in nuts, make sure they are aware of the possible dangers of nut allergy. It is a good idea to teach you child not to share nuts with other children. 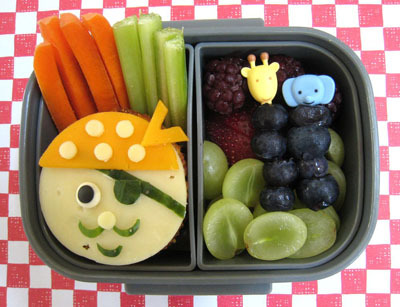 Teach your child to keep their lunchbox away from direct heat – radiators, sunlight etc. Some schools will refrigerate packed lunches.